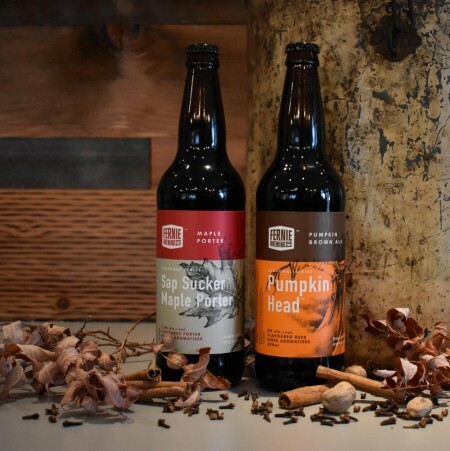 FERNIE, BC – Fernie Brewing has announced the return of two seasonal favourites for fall. It’s a uniquely rich and flavourful product made with 7 malts including Chocolate, Black, Carastan and Crystal. Maple Syrup is added post fermentation, which adds a slight maple smoothness to the finish. Think of it as a Traditional London Porter with a hint of Canada. This favourite brew is derived from an FBC staple First Trax Brown Ale, but is brewed with organic pumpkins, cinnamon, nutmeg and numerous spices to give it that comfortable fall feel. Unfiltered to keep the real pumpkin taste alive, it’s brewed with Willamette Hops and an extensive list of malts – including Chocolate, Brown, and Roast. A deliciously smooth and tasty accompaniment to your favourite fall fare. Both beers are available now at the Fernie retail store, and will be rolling out in coming weeks to liquor stores in BC, Alberta, and Manitoba (Pumpkin Head only). Sap Sucker will remain in production until early 2018, while Pumpkin Head will only be available for a limited time.